Paul Kaplan talks about his biography, Lillian Wald: America’s Social and Healthcare Reformer. Wald was one of the most influential but least known people of the early 20th century. She founded the Visiting Nurse Service, but realized that to really tackle poverty, the conditions immigrants and their kids lived in needed to change. In treating the whole person, Wald changed the whole notion of social service for the poor. 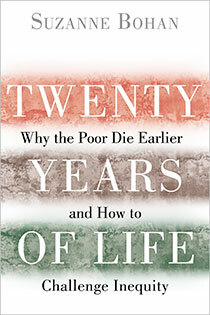 Then, health and science journalist Susan Bohan talks about her book, Twenty Years of Life: Why the Poor Die Earlier and How to Challenge Inequity. It’s about how your zip code determines your health. Were it not for the wave of immigrants who flooded into our country at the turn of the 20th century, we might not have had school playgrounds and school lunches today. She founded the Visiting Nurse Service, but realized that to really tackle poverty, the conditions immigrants and their kids lived in needed to change. They needed education, playgrounds, enough food to eat and sanitation. In treating the whole person, Wald changed the whole notion of social service for the poor. 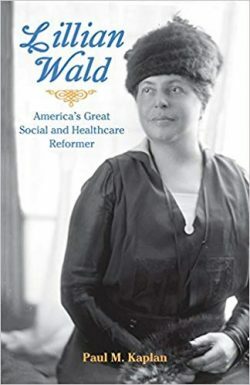 Paul Kaplan’s biography, Lillian Wald: America’s Social and Healthcare Reformer, explores the life of this inspiring figure. The book is geared toward middle and high school students, but is a fascinating read for anyone of any age. Paul Kaplan is the author of several books about history and cultural figures, including one about Jewish New York and a biography of Irving Berlin. Studies have shown that your zip code determines your health. People who live in poorer communities die on average twenty years earlier than people who live in wealthier communities. That’s the shocking statistic at the center of Susan Bohan’s book Twenty Years of Life. In it, Bohan not only explains the reasons for this health disparity, but also how one bold experiment is working to change it. She shows how the health foundation, the California Endowment, is upending the old-school, top-down charity model and investing $1 billion over ten years to help distressed communities advocate for their own interests. This new approach to community change draws on the latent political power of residents to drive reform locally and in the state’s legislature. Suzanne Bohan is an award-winning health and science journalist. Her work has appeared in the Sacramento Bee, the LA Times, Washington Post, Boston Globe, and other newspapers nationwide.